What was supposed to be just another day on the job for 25-year-old Phineas Gage turned out to be anything but, with events transpiring to make him a legend – in neurology anyway. 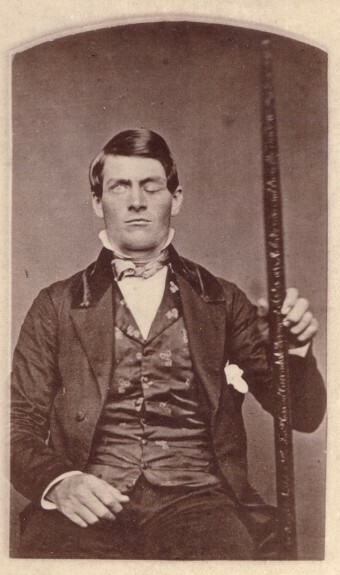 On that fateful day, Phineas Gage suffered a traumatic brain injury when a very large iron rod went through his head. Despite this, he survived and became one of the first to demonstrate a clear link between brain trauma and personality change. On September 13, 1848, Gage was helping excavate rocks to make way for a railroad track on the Rutland and Burlington Railroad near Cavendish in Vermont. Just prior to the accident, Gage was preparing for an explosion by compacting a bore with explosive powder using a tamping iron. A spark created from the tamping iron ignited the powder, driving the iron straight through Gage’s skull. It entered under the left cheek bone and exited completely through the top of the head, and was later recovered some 30 yards away, smeared with blood and brain matter. To have an idea of extent of damage this iron would have caused, you need to realize its size. The tamping iron was 3 ft 8 in. (1.11 m) in length and 1.25 inches (3.18 cm) in diameter at one end and tapered over a distance of about 1 ft., to 0.25 inches (0.6 cm) in diameter, weighing approximately 13 pounds (6 kg). When I drove up he said, ‘Doctor, here is business enough for you.’ I first noticed the wound upon the head before I alighted from my carriage, the pulsations of the brain being very distinct. The top of the head appeared somewhat like an inverted funnel … as if some wedge-shaped body had passed from below upward. Mr. Gage, during the time I was examining this wound, was relating the manner in which he was injured to the bystanders. I did not believe Mr. Gage’s statement at that time, but thought he was deceived. Mr. Gage persisted in saying that the bar went through his head …. Mr. G. got up and vomited; the effort of vomiting pressed out about half a teacupful of the brain, which fell upon the floor. By evening, Dr. John Martyn Harlow had taken over the case and it was his notes of observations about Phineas’ injury, subsequent recovery and personality changes that provided evidence that the frontal cortex is involved in one’s personality. The initial treatment of Phineas’ physical injuries included cleaning the wound by removing small fragments of bone and replacing some of the larger fragments that were still attached but displaced. The large wound at the top of his head was closed with adhesive straps and covered with a wet compress, to allow the wound to drain into the dressings. Within days, his exposed brain became infected and he fell into a semi-comatose state. To his family’s relief and surprise, he recovered. Not long after that, Dr. Harlow had to release 8 fluid ounces of pus from an abscess under George’s scalp. His contractors, who regarded him as the most efficient and capable foreman in their employ previous to his injury, considered the change in his mind so marked that they could not give him his place again. He is fitful, irreverent, indulging at times in the grossest profanity (which was not previously his custom), manifesting but little deference for his fellows, impatient of restraint of advice when it conflicts with his desires, at times pertinaciously obstinent, yet capricious and vacillating, devising many plans of future operation, which are no sooner arranged than they are abandoned in turn for others appearing more feasible. In this regard, his mind was radically changed, so decidedly that his friends and acquaintances said he was ‘no longer Gage’. Not the same man he used to be and denied employment by the railroad company who used to see him as an efficient and capable foreman, he worked for a short time at a livery stable in New Hampshire, among other odd jobs. He then spent seven years as a stagecoach driver in Chile until his health began to deteriorate. Evidence uncovered very recently, in 2008, seems to indicate that before his demise while working in Chile, Gage had recovered most, if not all, of his former social skills and was otherwise a pretty normal guy at this point. Once his health declined, he moved to San Francisco with his mother where, after suffering a series of epileptic seizures he died on May 20, 1860 at the age of 36 – almost 12 years after his accident. It wasn’t until 1866 that Dr. Harlow, who had thought he would never hear from Phineas again, learned of his death. At his request to the family, Phineas’ skull was removed from his grave and sent, along with the tamping iron that had pierced Phineas’ skull, to Dr. Harlow in Massachusetts. Today, both can be seen at the Harvard University School of Medicine in the Warren Anatomical Museum.